Make Money With Your eBook - [New Or Old] | Blog About Tips And Tutorials. Now we’ll talk about how to make money blogging with eBooks. I’ve been creating eBooks since 2017. The best part about eBooks is they are easy to create, and you can sell them for a long time. Here are some common questions and answers about creating an eBook. How Long Should My eBook Be? Your book should be at least 40 pages so the buyer will see the value in it. That doesn’t mean it has to be 40 pages, single spaced, a 10-point font in an 8.5“x11” page size. Format it how you like – big fonts, pictures, charts, lots of white space. If I bought this book, would I feel like I got a good deal? How Do I Format An eBook? eBooks are delivered in PDF format. You can do it yourself by printing a Microsoft Word file or Google Doc to PDF format. It takes about 2 seconds. If you want a nice cover you can hire a graphics artist on Fiverr or Upwork to create one for you. You will pay anywhere from $5 (Fiverr) for a simple cover to $299 if you use a service like 99Designs. I used 99 Designs for the cover of my book. I was very pleased with the service. If you have the money to spend (which you will someday if you keep blogging) – they are worth checking out. I’ve paid $10 for eBooks that were 30 pages long. I’ve also paid $29 for eBooks that were 100 pages long. How you price your eBook is based on the value you provide, and how your book compares to similar products (if there are any). A good price point is less than $10. Most people are willing to part with $10 for a book. How Do I Sell An eBook? Selling an eBook is as simple as setting up an account with PayPal and slapping a PayPal button on your website. Gumroad is a popular service that connects to your blog and allows you to sell digital products. It’s only $10 a month for the service, and they take a small percent of each sale to cover the credit card transaction fees. e-junkie is another great service which can have you up and selling in minutes. 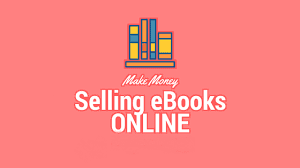 Can I Make Money Selling An eBook? Have you ever bought an eBook or a Kindle book? Which brings me to my point – yes, it’s possible to make money selling an eBook on pretty much any topic. Here’s something else to consider – people don’t necessarily want to read all your blog posts. You may write one blog post on a topic and then six months later write something else on a similar topic. People will pay you if you consolidate your blog posts and turn it into a book. why would anyone pay me for an eBook when they can get it on my blog for free? You’re saving them time because they don’t have to dig around your site for all of the information. It’s no different than if you’re searching the Internet to learn about something. What’s easier – searching out ten different sites, or finding the one site that has all of the information in one place? Tiffany “The Budgetnista” Aliche took all of her blog posts on budgeting, and rolled them into a best-selling book on Amazon! It was the same content, but people wanted something that had all of the information in one place that they could easily read front to back. 1. Start writing! If you haven’t started writing in your blog yet – start writing. Sit down and write 500 words today about your blog topic. The eBook you’re going to want to create for extra income can come right from your blog posts.